Operating table ALVO Preludium 4-01 has been designed to support the patient during all surgical procedures and interventions: general surgery, vascular surgery, endoscopy, neurosurgery, gynecology, urology and orthopedic procedures. 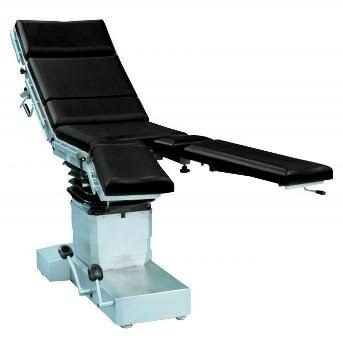 ALVO Preludium 4-01 is a hydraulic-mechanical, mobile operating table is made of stainless, acid-proof steel, with sectional table top and mobile base equipped with mechanical central brake. Standard version offers vertical adjustment provided from hydraulic system driven by a foot pump. lateral tilts and body elevator adjustment is performed by crank mechanism. Other functional movements - longitudinal tilts and table top sections adjustments are gas spring supported. Second, customized version of Preludium table offers all three movements of the column (height, trend, side tilts adjustments) driven from the foot pump. Two available versions of mechanical-hydraulic systems used for driving the table column helps to fulfill customer requirements and make this cost attractive and reliable table even more attractive.